Under attack from the Opposition on allocation of a coal block in Odisha, the Prime Minister's office today categorically rejected any criminality asserting that Prime Minister Manmohan Singh took the decision on "merits". The PMO emphasised Dr Singh was the "competent authority" to have cleared the proposal moved by the Coal Ministry in 2005. Days after a terribly brutalised child domestic worker was rescued from her employer�s house in an upscale Delhi locality, the first global documentation of slavery has revealed that India houses the maximum number of �modern-day slaves� in the world. A big political fight has begun between the ruling SAD-BJP and the Congress to corner the community-based vote banks, especially the largest Dalit chunk, in Punjab. It would appear that the function organized by the SAD at Amritsar yesterday to lay the foundation stone of Valmiki Temple was aimed exactly at that. Addharmis and Valmikis are two powerful sub-groups among Dalits. 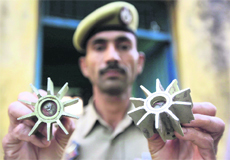 In the biggest ceasefire violation along the 191.5-km International Border in a decade, Pak Rangers rained mortars and heavy machinegun fire on at least 26 Indian posts and some villages in Jammu and Samba districts. Two BSF personnel were injured on Friday and a Pakistani intruder was killed in retaliatory firing. The Himachal Pradesh High Court today quashed the State Private Educational Institutions (Regulatory) Act, 2010. The verdict will have far-reaching consequences for the higher education sector, which is already in a mess in the state in the absence of effective regulation. The trade ties with Russia and China will be high on the agenda when Prime Minister Manmohan Singh embarks on an official tour of the two countries between October 20 and 24, besides interaction on bilateral, regional and international issues.